I'm writing this post on behalf of Alexander Ovchinnikov who is the author of DataObjects.Net Extensions project. 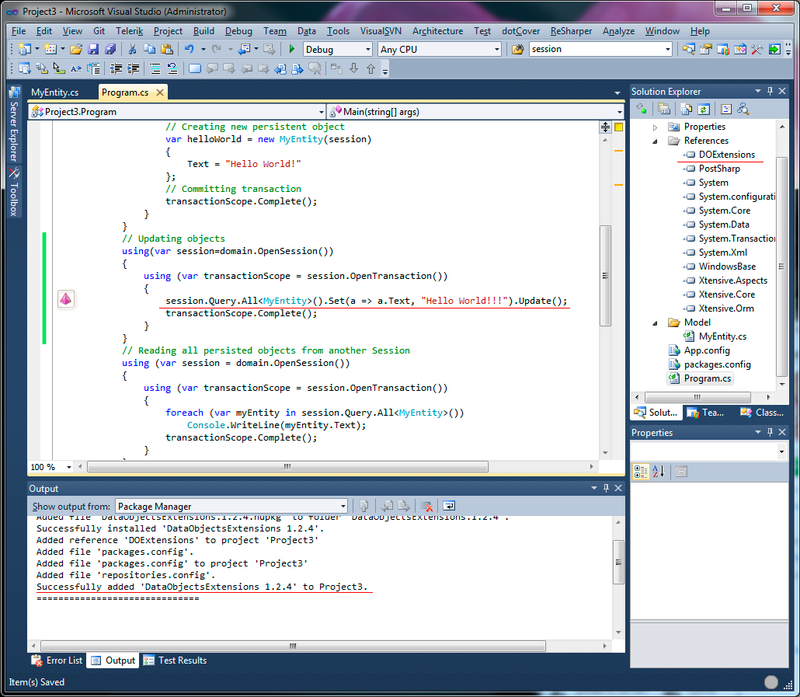 Earlier Alexander developed LINQPad provider for DataObjects.Net, which is included into standard DataObjects.Net installation package starting from version 4.5, so he is deservedly one of the most productive contributors in DataObjects.Net community. In this post I'll describe the first part, batch server-side update and delete operations. 1. The extension is distributed in a form of NuGet package, so to use it you should install NuGet Manager if you haven't installed it already. As far as I know, Visual Studio 2010 SP 1 already includes this manager by default. 2. 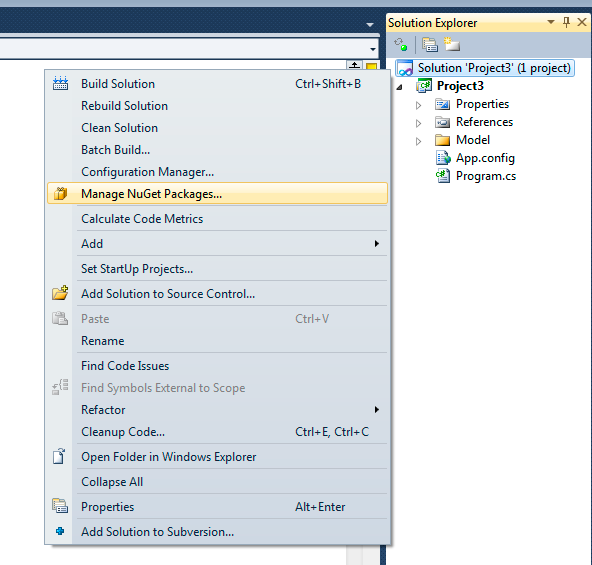 Open the desired solution and in the context menu select "Manage NuGet packages..."
4. Click "Install", choose projects to add the reference to and click "OK". 5. 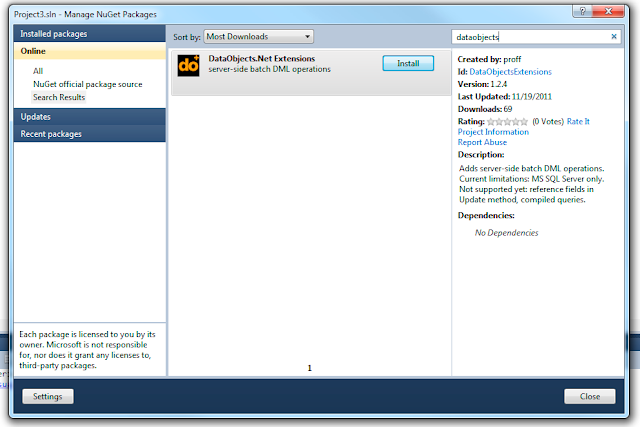 Check that the package is successfully installed and start using it. This model will be used in code samples. Well, Captain Obvious to the rescue, sometimes there could be a scenario when a set of records needs to be updated without fetching them on client. There might be various reasons for that such as performance issues, limitations of business logic, etc. In such cases users have to utilize old good plain SQL to execute "UPDATE" or "DELETE" commands via underlying ADO.NET providers. But while this is not always convenient, this also could lead to potentially erroneous results because as soon as domain model changes, it becomes out of sync with these SQL commands. Listed below are some scenarios which you might encounter while using the package. Every case is followed by the corresponding translation to SQL. All overloads of Query.Single, Query.SingleOrDefault methods are also supported. All overloads of Queryable.Single, Queryable.SingleOrDefault, Queryable.First, Queryable.FirstOrDefault methods are supported. Note, this way always leads to a subquery, so if key of referenced entity is known, it is strongly recommended to use the 1st way. Note, while you have to populate the constructor with arguments because compiler requires that, it will never be called, only the object initializer will be processed. So it is safe you set fake arguments to the constructor. In all other ways these 2 kinds of syntax are equal, just choose the one that is convenient for you. Delete syntax is pretty straightforward, no new rocket science is here. It is almost the same as Update syntax, but use Delete instead. 1. This version supports Microsoft SQL Server only. 3. Session.SaveChanges() method is executed before any batch server-side operation. This might lead to validation of entities, depending on validation configuration. 4. Every batch server-side operation cleans Session cache to provide data consistency. 5. Batch server-side operations don't support compiled LINQ queries. All credits go to Alexander Ovchinnikov. 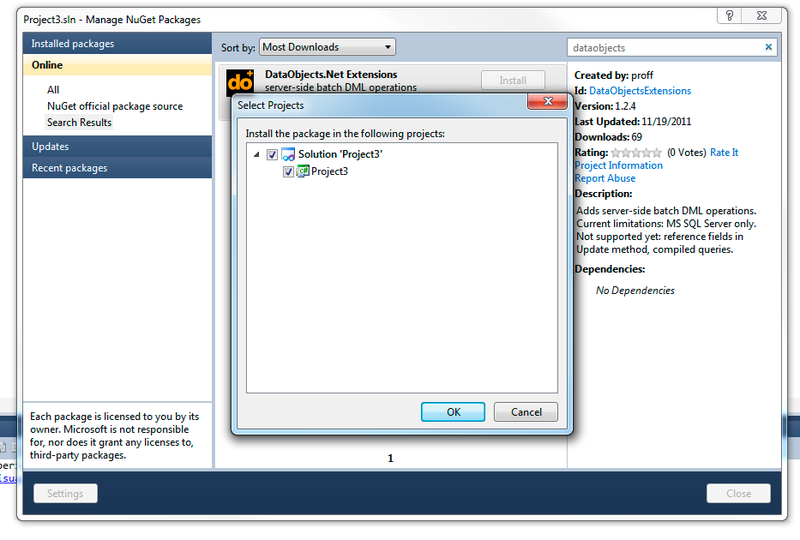 The extension is a must-have, I'm absolutely sure that it will be very popular among DataObjects.Net community. The second part is coming soon. Stay tuned. Nice extension, really great work Alexander! Alex, you've already got the infinite number of developer licenses. Wow! I like to see stuff like this.